The Geminid meteor shower peaks Sunday (Dec. 13) and Monday (Dec. 14), 2015. 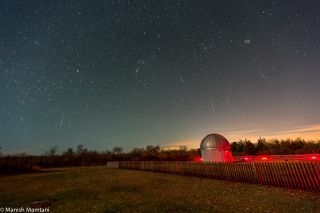 Shown here, astrophotographer Manish Mamtani caught this snapshot of the Geminid meteor shower over the Frosty Drew Observatory in Charlestown, Rhode Island in 2014. The Geminid meteor shower will be in full swing the nights of Dec. 13 and Dec. 14, and experts are saying it's going to be the best meteor shower of 2015. The online Slooh Community Observatory will air a live webcast about the Geminids on Monday, Dec. 13 beginning at 6 p.m. EST (2300 GMT). Hosted by Slooh's Community Manager and astronomy expert Paul Cox, the webcast will feature views of the Geminids from five countries on four continents. Viewers will also learn more about what causes this shower of shooting stars. You can watch the webcast directly at http://www.slooh.com. The "shooting stars" seen during a meteor shower are bits of rock burning up in Earth's atmosphere. The annual Geminid meteor shower is caused by debris from an object called 3200 Phaethon. According to NASA, 3200 Phaethon was "long thought to be an asteroid," but is now classified as an "extinct comet," meaning the water ice and other volatiles on its surface have totally evaporated, leaving only a rocky object. Earth passes through the debris field once per year, and the "shooting stars" appear to radiate from a point in the constellation Gemini — hence the name "Geminid." The Geminid meteor shower of 2015 will appear to radiate out of the constellation Gemini in the eastern sky in the late-night sky, as shown in this sky map from Sky & Telescope magazine. The Slooh webcast will include more than views of the meteor shower. In an email to Space.com, a Slooh representative said that viewers will "learn about the surprising 'rock comet' that causes this active shower, and dive into the mythology of the Gemini twins, Castor and Pollux. We'll also tell you all about how you can hear meteors as well as see them, and give you a quick tutorial on taking your own meteor images." NASA's Marshall Space Flight Center in Huntsville, Alabama, will also host a live "Tweet chat" on the meteor shower on the night of Dec. 13, from 11 p.m. EST (0400 GMT Dec. 14) until 3 a.m. EST on Dec. 14 (0800 GMT Dec. 15). NASA experts — including Bill Cooke, Danielle Moser and Rhiannon Blaauw — will be on hand to provide commentary on the meteor shower and answer questions. Members of the public can tweet their questions to "@NASA_Marshall" or simply use the hashtag "#askNASA." If you're in the Northern Hemisphere, be sure to bundle up before going outside. Keep an eye on weather reports to find out when the sky will be clear for viewing. Sky and Telescope magazine advises giving your eyes time to adjust to the darkness — at least 20 minutes should do the trick. The Royal Astronomical Society (RAS) in the United Kingdom states that meteors are best seen with the naked eye, so no telescope or binoculars are required. Viewing conditions may vary depending on what time viewers look skyward. "Meteor watchers may want to look at different times during the night," RAS representatives said in a statement. "Because of the rotation of the Earth, in the early evening, the edge of the cloud of debris that makes up the Geminids skims the atmosphere, leading to a few 'Earth grazer' meteors that can have long paths across the sky. Later on in the night, observers are looking up as their part of the Earth is facing right into the debris, so the number of meteors is usually much higher." If you can't see the meteors during the Geminid meteor shower, you could try listening to them. The website LiveMeteors.com captures radio signals that are reflected off the "trail" of a meteor. The trail includes the streak of light seen by skywatchers, as well as disrupted air molecules. According to the website, "This trail is capable of reflecting radio waves from transmitters located on the ground, similar to light reflecting from a mirrored surface. Meteor radio wave reflections are also called meteor echoes, or pings." The page also provides a visualization of the spectrum of the meteor echoes. Editor's note: If you capture an amazing photo of the Geminid meteor shower, or any other night sky view, and you'd like to share it with Space.com and our news partners for a story or gallery, send images and comments in to managing editor Tariq Malik at: spacephotos@space.com.